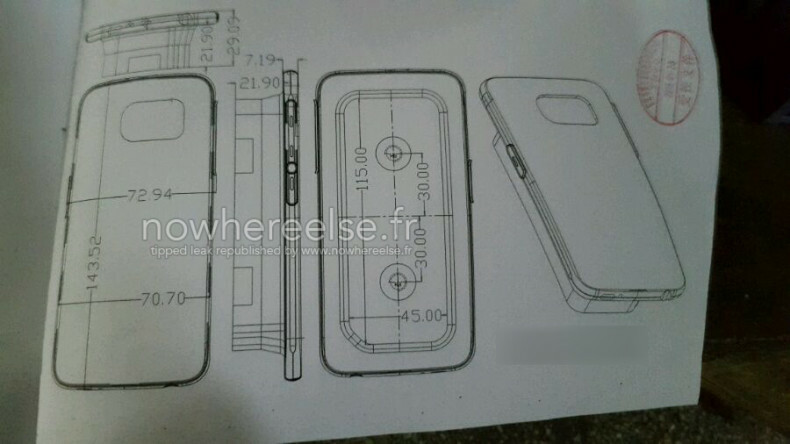 An accessory manufacturer for Samsung devices has detailed schematics that reveal some changes to the highly anticipated Samsung S6 smartphone. According to the images the Samsung S6 will measure 143.52mm long, 70.70 mm wide (72.94 mm when you include the buttons) and 7.19 mm thick. The Samsung S5 measures 142 mm long, 72.5 mm wide and 8.1 mm thick. This indicates the S6 will be thinner, narrower, and longer than the S5. I personally think the S5 is too wide, as sometimes I have to use two hands to reach features that I can easily activate using my thumb on narrower phones. Accessory manufacturer, Spigen, is already selling Galaxy S6 cases on Amazon. Spigen’s cases show that the light and heart rate sensors will be placed in a different location than on the S5. Spigen has sold cases and accessories to precisely match design elements prior to launches of Android devices in the past. Samsung said in their earnings report that they would use new materials in their smart phones. It is widely expected that the S6 will be housed in aluminum unibody chassis like the iPhone 6 and HTC One.